Online poker in the US is hit or miss. Only 2/3 of the states are ‘ok’ with it, and even then players have to deal with finding a trustworthy site to play at, the legalities of online poker in their area and banking, or the lack thereof. We understand how difficult and confusing it can be to play online poker in the USA. So what we’ve done is list our top USA-friendly poker sites below. Following that you’ll find some information about the legality of online poker, challenges US players face and intrastate poker and what the future holds for our favorite game down the road. Enjoy! 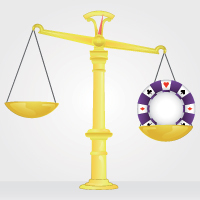 One of the most asked questions we get regarding online poker in the US, is if it’s legal or not. It’s a fair question. You see things like the UIGEA, Black Friday and all the news about each state declaring poker as a game of skill or luck, and wonder how it affects your ability to play poker online. Understandable. I want to answer this question for everyone. To do that I need to briefly explain these events, or at least the ideas behind them. Starting with the UIGEA, this was attached to the Safe Port Act in 2006. The idea behind the bill is to prohibit banks and credit unions from processing transactions from players to the gambling operators. That’s it. There’s nothing in the bill making online poker in the US illegal. In fact, most of congress didn’t even see the UIGEA attachment. It’s possible that the bill would not have passed, or been altered differently than we know it, if they did. This leads us to Black Friday. Black Friday is the day that sites like PokerStars, Full Tilt, Absolute and Ultimate Bet Poker were charged with crimes like money laundering and bank fraud. They created fake companies so that banks would process their transactions. And the DOJ wasn’t having any of that. So, this is the perfect example of the UIGEA in action. So, as you can see, the UIGEA and Black Friday has nothing to do with online poker being legal. It has everything to do with the money the poker operators are trying to process. So why don’t more sites cater to the US market? Why do sites like Party Poker or 888 not operate in the US market? Risk management. You see, the laws are always changing in the US, for one thing. Secondly, each state determines whether or not online poker is legal, so then that forces operators to geo-target for (or to exclude) specific states. Thirdly, funds still need to be processed to and from the sites (from player’s banks). And last, it’s a risk that many of these larger sites don’t want to take on, as they have investors to answer to. So, in short, the legality of online poker depends on the state you live in. And it has nothing to do with the laws that have been passed on a federal level. Since online poker in the US is not so black and white, US poker players will face a number of challenges if they want to play. I don’t mention these to try to discourage you from playing online, but instead to let you know the hurdles you face so that you can be ready for them. The biggest challenge you’ll face is finding a site worth playing at. A lot of operators jumped into the market because they wanted to fill a gap in the market left by the bigger operators that left post Black Friday. However, not all of them are safe and trustworthy, let alone have the games, stakes and traffic you’d want in a site. Another challenge that US players will face is banking. Obvious, right, considering that it’s illegal for banks to process transactions from US players. So what you’ll want to be prepared for are credit/debit cards being declined, having to find other forms of payment and delays in receiving withdrawals, assuming your bank accepts your check in the first place. Each licensed poker site has strict geo-targeting and personal identification protocols in place to ensure that only players RESIDING in that state can have access to the games. So if you’re one of the lucky people able to access real online poker in these locations you better be prepared to go through a tight screening process – one that is COMPLETELY worth it in the end. I say this because once you are verified you will have instant access to quick deposits and even faster withdrawals of your hard-earned money. You’re able to deposit easily via credit card, Skrill, Neteller and even PayPal! The withdrawals are just as seamless and you’re able to use many of those same methods to facilitate your cashout.